Last year we gave caravan and motorhome owners the chance to win a year’s free insurance with us by filling in a simple entry form on our website. We received hundreds of entries and this month we drew our lucky competition winner. 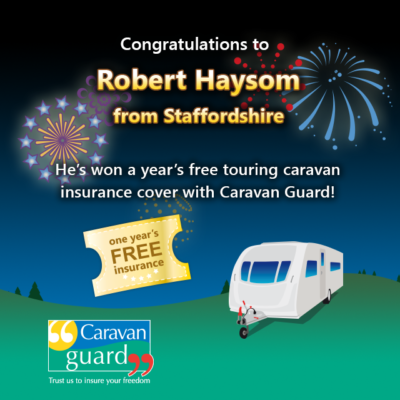 A huge congratulations to Mr Robert Haysom from Staffordshire, who entered our prize draw in May last year and can now look forward to a cost free year of 5-Star rated cover for his caravan. Our touring caravan insurance policy gives customers the peace of mind that their caravan will be covered for accidental damage, fire, theft, storm and flood, should disaster strike. Mr Haysom was delighted to have won. 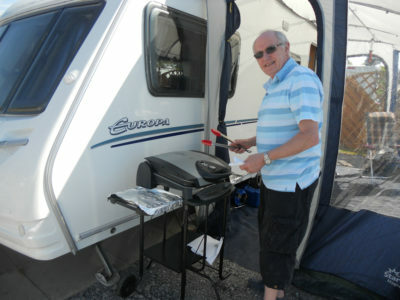 Here he is with his Sterling Europa 520 caravan cooking on the barbecue! Caravan Guard’s tourer and motorhome insurance policies come with the reassurance of extensive cover backed by leading UK insurer RSA. Caravanners and motorhome owners can tailor their cover with options to suit their caravanning or motorhoming needs.